Harold Everett Hitchin (sometimes recorded as Ernest Harold), the son of John Everett and Ada Hitchin, was born in Long Eaton, Derbyshire in 1897. He had two brothers and two sisters and lived in Long Eaton, working as a lace draughtsman until he enlisted in the 12th Battalion Durham Light Infantry (DLI) in 1915. He was soon promoted to corporal and, after landing in France on 25 August, was promoted to sergeant, A year later he was awarded the Military Medal (MM) and a Bar to it in December. At the end of 1916 he was commissioned in the field as a 2nd Lieutenant into the 18th (Durham Pals) DLI and was awarded the Distinguished Service Order (DSO) in March 1917, when he and James Bradford, one of the Bradford Brothers of Whitton Park, rushed and bombed enemy positions near Gommecourt. 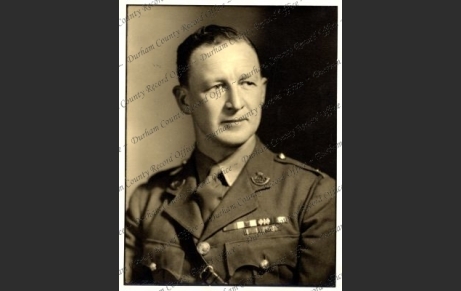 He was then appointed temporary Lieutenant, acting captain and won the Military Cross (MC) in May 1917 for leading an attack on a defended windmill at Garvelle, during the Battle of Arras. He was badly wounded in June 1918 and relinquished his commission in February 1920 and was transferred to the Reserve of Officers as a Captain in 1924 . During the Second World War he served in the 15th Battalion but, when it converted to a tank battalion, he transferred to 14th DLI. Later he took up bee-keeping in Norfolk, where the 1939 register shows him as being married. In 1946 he was released on reaching the age limit of liability to recall with the rank of Major and he later moved to Wales where he died in 1975. “For conspicuous gallantry and devotion to duty when in command of a bombing party. He made three most gallant attempts to force his way into the enemy’s position and himself shot four of the enemy with his revolver. Later, he voluntarily joined in another Company’s attack, and rendered invaluable assistance. He was largely responsible for the final success of the operations”. ” For conspicuous gallantry and devotion to duty. When in command of a company he led four successive attacks upon a position of great tactical importance. His personal daring and skillful use of ground enabled him to capture it at the last attempt after losing 50% of his men. His gallantry and good leadership were most marked”.